Behind the Scenes: Merry Christmas! And, since I can’t send you each a Christmas card in the mail, I hope you’ll enjoy this little digital bit of love from our favorite girl. To say she loves Christmas is an understatement. And that tree? Well. It might just have a special switch on the floor now, a gift from her daddy so she can safely turn the lights. A small purchase that has made our two year old jump with joy, raise her hand victoriously when we asked who turned on the lights, and rush into the living room with glee as soon as she wakes in the morning. Behind the scenes of our Christmas prep? It hasn’t been all giggles and Christmas lights. As our hearts have sought God’s will and we’ve made decisions that will make 2014 a year of incredible change, we have struggled. The day the door opened, we felt joy, but also discouragement and attack. The day it was shared, I fell ill and haven’t been well since. The sickness, discouragement, emotional roller coasters, and anxiety – this season has been hard, but we give thanks in it, because we know that the enemy of our souls wouldn’t be caring quite so much if we weren’t doing what God has called us to do. So this holiday season, we are exhausted. We are dealing with a lot, more than I’ll ever write here. And yet? That little girl smiles and it all goes away. 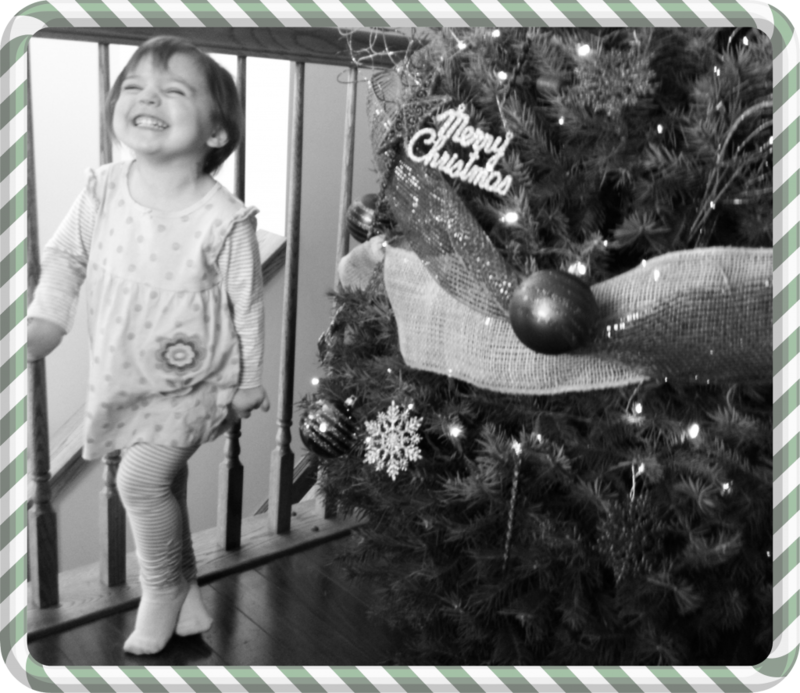 Just for a moment, the wonder is back, not wrapped in glitter or covered in bows, but a twinkle in a toddler eye. And that’s all I need right now. Crystal – We so need to look at Christmas through the eyes of a child. We probably should do that every year, no matter! Surely the joy & wonder on their faces gives us reason to pause & wonder ourselves. May you & your family be blessed with His peace & joy this Christmas! Grateful for all you do to create community for us all! Your little angel is just adorable, and I see so much of you in her sweet face! May we all experience Advent and Christmas this year with that much pure joy. Oh friend, the delight in her smile and her little dance caught right there in frame is so precious! Please know that you are in my prayers… God has placed your name on my heart quite a bit these past weeks and you need to know that each time He does I whisper your name right in His ear. He holds you close friend and He pursues. Because I’m hosting a ‘Tell Your Christmas Story” month on my blog, It doesn’t feel right to blog my own blog at the same time. So, I thought I would share in the Comments. Though I tried to glue his beard back on it continued to fall off. So I left it as is, and hung it anyway. Now, my dilemma is trying to decide which son should inherit the short bearded Santa. Oh I enjoyed this so much Diane! Praying for you and all 2014 holds!! Your picture is amazing! So beautiful!!! Great job at capturing the joy of Christmas! Have a Merry Christmas and a happy New Year! God bless! See you around here in January:). Merry Christmas to you, Jennifer 🙂 You are such a gift!